Last week I was reminded of the reality of human suffering. It began when our Unity Team Prayer Group (which meets the last Sunday of each month at 9:30 a.m.) discussed how Christians respond to suffering. Monday I prayed at a viewing for a young man who took his life. Tuesday I had a funeral Mass for a dear and sweet friend, Joseph Barbine, who died at age 87 in a car accident. Wednesday, I was saddened to learn that although Saudi Arabia has more than 100,000 fully equipped tents — air conditioners, electricity and stoves — that are used five days a year, suffering Syrian refugees may not use the tents for shelter. Suffering is real. So how do we respond to it? Let me offer some suggestions. First, the Old Testament story of Job reminds us we are God’s children. We are not God. We will never fully understand why the innocent suffer. We can only be humble and trust in the mercy and goodness of God who gives us the gift of life. Second, suffering is a part of being human. Since Jesus was fully human he suffered. The night before he died he prayed to escape “the cup” but was willing to accept suffering to reveal God’s love and mercy for all humanity. Suffering helps us to remember: it is a part of being human; it has a way of revealing who we and our friends are; and in a way it can be redemptive if our hearts grow in the grace of compassion rather than the poison of bitterness. Think of a person who is a sponsor in Alcoholics Anonymous. The sponsor first had to deal with his or her own demons before entering recovery and becoming a help to others who suffer with addiction. May the suffering of Job and Jesus be a source of hope and courage for all of us. If Jesus suffered, we will suffer, but faith and humility will be our salvation. 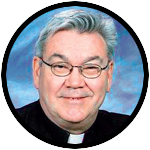 Father Joseph M. Corley is pastor of Blessed Virgin Mary Parish, Darby. Well said/written, Father! Think about writing your thoughts for NCR.